Dr. Edwin J. Cunningham is a board certified Neurosurgeon affiliated with CoxHealth in Springfield, Missouri. An undergraduate alumnus of the University of Notre Dame, Dr. Edwin Cunningham attended medical school at St. Louis University School of Medicine (1991-1996). 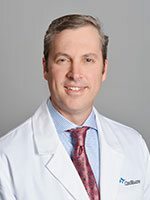 Following his time at SLU, Dr. Cunningham went on to complete his neurosurgical residency at the Cleveland Clinic Foundation in 2003. Dr. Cunningham remained at the Cleveland Clinic for an additional 2 years to obtain his ACGME Endovascular Fellowship designation. In 2005, Dr. Cunningham moved to Springfield, MO, accepting a partnership at Springfield Neurological and Spine Institute. Since joining SNSI, Dr. Cunningham received his Board Certification in Neurological Surgery from the American Board of Neurological Surgery in 2008.